Archbishop Eamon Martin (left) and Archbishop Richard Clarke. 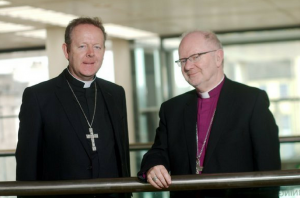 The archbishops of Armagh have released their joint Christmas message for 2018, in which they urged people to think of the homeless this Christmas. Archbishop Eamon Martin and Church of Ireland counterpart Archbishop Richard Clark released their statement yesterday, the Feast of St John of the Cross. In it, the archbishops reflected on the concept of home, noting that many Irish people living and working abroad would be returning to spend the festive season with their families and loved ones. “Home is a place of memories of years gone by, filled with familiar sights, sounds and smells and, of course, with the people who are most special to us,” they said. But the archbishops said there were many people in Ireland without a hearth or a home. Focus Ireland reckoned there were more than 9,700 people in the Republic who were homeless in October and, shockingly, a third of the people in emergency accommodation are children. In Northern Ireland, where homelessness figures are calculated differently, the housing executive reckons there were 18,180 homeless households last year. The two primates said: “Think for a moment of what it would be like this Christmas to be without a home. To be without a place of shelter. To be out in the cold. To be on your own, living on the streets. Sleeping in the shelter of a shop doorway. Not knowing where your next meal is going to come from. Not sure whether or not someone is going to attack you or abuse you for no other reason than the fact you are destitute or look different. In the 13 months between August 2017 and October 2018, 148 homeless people died in Northern Ireland. “Jesus readily identified with the homeless,” said Archbishops Martin and Clarke, quoting a passage from Luke’s Gospel, where Our Lord said “Foxes have dens and birds have nests, but the Son of Man has no place to lay his head”. For much of His ministry Jesus was a wandering preacher, travelling here and there without a permanent home, healing, teaching and bringing comfort to others, the archbishops said. “Even at the beginning of His life – in the story retold in the Christmas Gospel – He was born and laid in a manger, not within the warmth of a human home.